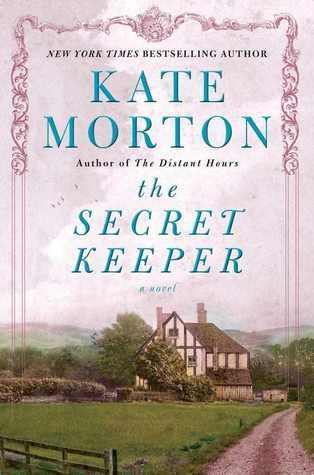 I finished The Secret Keeper and now I would like to pick it up and read it again, cover to cover, in one sitting. Kate Morton not only paints pictures with her words, she pulls you into the room with her characters and even pulls you into the characters themselves. At least that’s what happened to me while I read this book. There’s one scene in particular set in London during the blitz that I really do think made me feel the floor of the crumbling boarding house shake. You must read this book. I think it’s Morton’s best work yet. I’m not sure how to summarize the book; it’s so hard to give any details without giving this twisty plot away. The novel is set in England, mostly, and shifts between WWII, 1961, and 2011. There is also a brief chapter set in…well, I can’t tell you. Just like in The Forgotten Garden, The Secret Keeper begins with a daughter searching for answers about her family. Sixteen-year-old Laurel has a lovely family life, though she doesn’t always appreciate it, but when she’s on the brink of plunging into adulthood, she witnesses her mother commit a crime. The crime is completely out of characters and makes no sense to her. Laurel moves on with her life, but the past stays lodged in her mind until she finally decides to seek answers about her mother’s life. I’m always a bit wary of the type of novel where the plot is unraveled by a present day character discovering the truth through digging up the past. The first book I read that used that format was The Daughter of Time by Josephine Tey. Written in 1951, it’s a great detective story, but not necessarily a great work of literature. However, Kate Morton is masterful with this format–she knows how to keep the plot moving and seamless enough to keep her readers engaged through the changes in characters, settings, and times. I thoroughly enjoyed how the story line describes each character more fully as the plot thickens so that by the end of the book, you feel as if you really know them (if you’ve read more than one of my posts, you know character development means a lot to me). So make haste to grab The Secret Keeper and read it for fun or for perspective on parenting and mother-daughter relationships. Either way, you won’t be disappointed. By the way, if you’re a fan of Kate Morton you may also enjoy The Thirteenth Tale by Dianne Setterfield. It’s a bit darker, but it’s similar in settings and style. Next post Winter is for reading. But here’s my Summer Reading List.